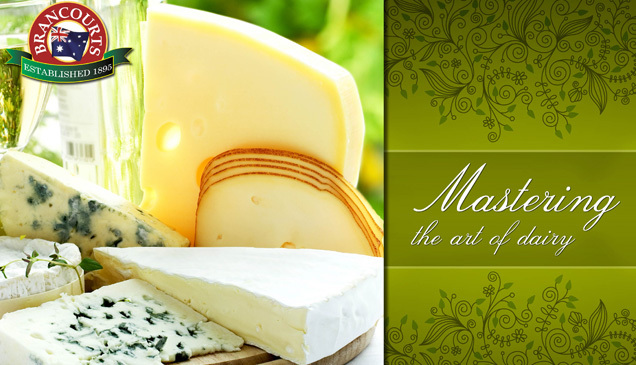 Brancourts Master Cheesemakers has made itself successful over a long period of time; time they have spent perfecting the products line. Their history is a long one that reaches back as far as the late 19th century, when Julius Brancourt established the company in 1895. Since that time, Brancourts has prided itself on producing some of the finest dairy derived products in Australia. “Julius Brancourt was the first person in Australia to make brie cheese. He initially started the Brancourts business delivering cream around the Bankstown area in Sydney by horse and cart. After a while he then decided to go into other dairy based products after establishing himself. Cheese was one of his passions and that’s when it all started.” says Shane Snowden, Sales Manager at Brancourts. Brancourts has maintained its operations as an independent fine diary product producer even after all this time, resisting the trend towards mergers and acquisitions in the increasingly globalised market. “We have come a long way from our original farm on Brancourts Avenue, but our traditional products have remained the same,” Snowden says. They still operate from the original farm site as their national office and warehouse and they have continued to use traditional methods and manufacturing processes that they have found ensure quality and product integrity. “The business is currently run by the fourth generation of Brancourts, and we are proud to still be a family owned operation,” he says. Real movement in the business began about five years ago, when they expanded from their two sites to four. “We now have manufacturing facilities in Victoria and New South Wales. This assists us with everything from milk supply, to continuity of supply, for different projects,” he says. The four facilities as they stand now are Yagoona, Auburn, Hexham in New South Wales, and Traralgon in Victoria. “We opened Traralgon in 2006, and in 2009 we had to place an extension on it as we had out grown the facility in a very short time. In March 2010 we purchased the Oak Factory in Hexham, from National Foods.” Snowden says they were able to take full control of the facility in April of this year. From this facility at Traralgon, Brancourts produces their award winning yoghurt’s and white fresh cheeses such as fetta, ricotta, and mozzarella. Auburn produces their bocconcini range; it is also where they are able to do some of the pre-packaging of their products before they get to retailers. Hexham fleshes out their offerings with cottage cheese and sweetened condensed milk. Snowden says that many of the awards that they have been recognised for are often a pleasant surprise to them, but at the same time, they act to vindicate their operational practices. “We are very particular on quality, and the products we produce are consumer driven. We make products that the consumer would want and not so much what a food competition would want. We could do a lot better in the judging aspect of these events if we focused on what judges want to taste.” He says that despite this they still do remarkably well in food awards. Brancourts produces products on a commercial basis; this means that they cannot implement some of the slower, single shot production methods. They still use traditional methods, but have refined them in a way that allows them to create more, and thus satisfy more people. Right now, Snowden says that they employ just fewer than 150 people, and that Brancourts consistently audits their relationship with these employees. This is part of their requirement to work with the National Food Retailers in Australia, but it has also increased their employee’s satisfaction with the corporate body. The quality of their products starts with the basic ingredient: milk. “Because we supply major retailers and food services customers throughout Australia, we conduct regular audits both from internal and external providers that make sure we are compliant with local, state and federal laws and legislations.” Snowden says that these guidelines help them continually produce quality products. “It is just a process that we have never had any issues with. We consider it a safe guard, but it lets us identify issues within our processes early on.” It is not often that you hear a manufacturer applaud Government regulations, or even attribute them to the success the company has had, but Snowden does not see them as a hindrance. Australia has some of the toughest food laws in the world, and it is because of these laws national and international markets know that they can trust food produced here. Snowden seems to say that these regulations have placed Australian food staples in high regard. “It is about making sure that what we produce is of a high quality. I think it is that simple,” he says. Part of Brancourts success has been due to the fact that though they may be able to produce a lot of volume, they have kept their range of products limited. “We try to be in products that are niche, so really there are only one or two manufacturers that are in the same product range as we are. If you have something that is a niche product, you can work harder at maintaining business and make market changes to suit the consumer trends. We focus on a limited range with a larger volume base,” says Snowden. “I think we have just come through a period where consumers were heading towards low fat dairy diets, but we seem to have gone through that and people are headed back to the full fat in dairy.” Snowden says that this is because consumers are beginning to recognise the additional benefits of this form of dairy product. “I think the taste quality is one of those important factors in this. There is a large low fat market here, but I really see a growing trend towards the full fat dairy products returning.” One way that they have approached this trend is by creating dessert yoghurts. “We have three flagship products and the first one would be our dessert style yoghurts. It’s an indulgent product that has full milk solids with added fruit. It is something you can have as a treat anytime or as a snack. If you wanted a traditional skim milk based product which you might have in a sugar free diet then you would move more towards our natural yoghurt products,” Snowden says that this is an important distinction, and that it is one that has made their yoghurts so different from the rest. Again, Brancourts looks for the niche, and then fills it with delicious possibilities. “Our other two flagship products are our ricotta and fetta cheeses. We supply both of these nationwide,” he says. “Ricotta has quite a short shelf life, so you only have anywhere from 15 to 20 days for the product once they reach retailers. You have to have very good logistics setup, and you have to have a very good model that lets you forecast your production needs, because you can easily end up with a lot of product that you are forced either to dump or donate to charities. We have built up a lot of experience supplying this product, especially to the East Coast of Australia, all the while making sure to optimise shelf life and make sure that we have minimal wastage.” Snowden drives home the point that it is not just what you make but how you are able to deliver it that can make or break a successful business. “Our focus remains on the domestic products here in Australia,” says Snowden. “Five years ago, Brancourts was a small family business, and today we are very much a medium sized dairy company that is performing well”. He says that this is because with their small family structure they are often more agile when it comes to navigating red tape, and innovating new products. “We have been approached by the larger manufactures, who recognise this, to help them deliver new products to market,” he says. “We are very focused on quality and we are very much still old fashioned. So we can deliver quality, good service and value to our customers. When they buy something from us they can be sure it is going to be of the highest quality and taste great. We often say to people that Brancourts is “dairy at its best.” He says their focus on niche products has allowed them to raise the bar in quality standards, and since dairy is the only thing they do, they make sure they do it very well.